like last saturday, i'm offering up more quick tips. but this time, it's on finances. makes sense to start right at the beginning though, just like organizing, and get yourself on a money plan for the entire year. don't you love it when someone else does all the work and planning for you? now i'm not talking about the money saving plan that's always floating around, where you save a different amount each week all year to end up around $1300 by christmas. (which is great of course, and very doable so i do recommend trying it.) but i'm talking much more in depth than just saving. 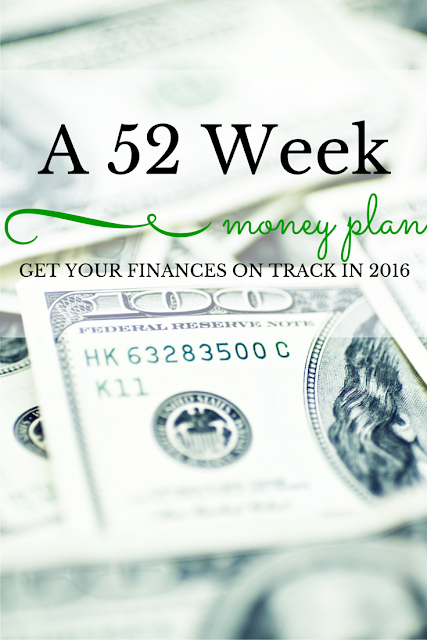 i'm talking about getting your financial life in order, week by week. just don't skip any weeks! it's all such useful information. you'll pay down debt if you have it, you'll save for retirement, you'll have a budget and not overspend at christmas. all the things you think are too overwhelming and difficult, you'll manage to do easily in this weekly program. you even get time off in august - take it. come back to me in december and tell me it didn't work for you, i dare you.